What great little discoveries you’ve made, Christine! And in such unexpected places, too, as you say. It sounds as though you enjoyed your holiday, too, and that makes it all even better. It reminds me of the time I was browsing in a small secondhand bookshop, and found a first edition of Ellery Queen’s The Dutch Shoe Mystery. It had some damage, so not worth much in terms of money, perhaps. But what a find (for me) in terms of unexpected! It is like finding treasure to come across a book like the Ellery Queen, isn’t it, Margot? There are rewards in being unable to walk past a book shop, especially a second-hand book shop. And, thank you, yes, I had a lovely holiday. Oh, I love these kind of discoveries. Secondhand book shops are alive and well here, in Quebec City. They seem to thrive here, in our French-speaking province. What’s great is the number of books in English I always manage to find. And yes, they are usually of an age. 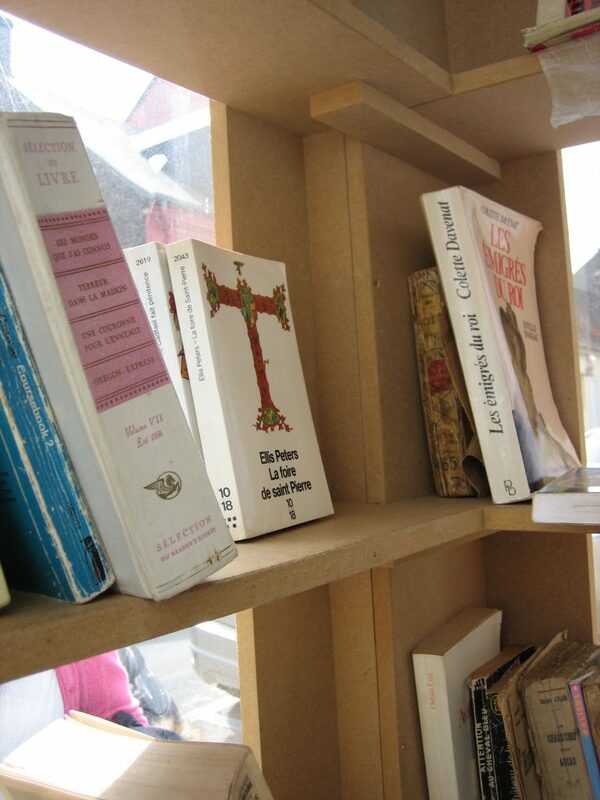 We also have little box cubby holes filled with free books people can take, and or swap. I must post a photo or two on my blog. Unusual finds have been a barn in Massachusetts that was filled with boxes of old books. I would have loved to have spent several days going through them all, but came away with a couple of classics whose titles I forget now. Yes, do post a photo of a cubby hole on your blog. I didn’t manage to see any second-hand bookshops when I was there – not that I could have carried any more books home so it was just as well! I do this much less now, but I used to be forever picking up books in unexpected places. Often when I look at one of my older detective books I have a memory of finding it in a tray or shelf for pennies in some small town in England. I also quite like abandoning books I’ve finished on holiday, hoping someone will find them, and perhaps be puzzled why something very English will end up in an obscure place. I recently gave a talk on Agatha Christie locally, and took along a few books. I said the first one I had read was Why Didn’t They Ask Evans, and brought along my copy. I actually hadn’t realized till that moment that it was the very copy I read all those years ago, and it had a little secondhand price sticker from a shop where the family had been holidaying: a remote part of the very Western edge of Ireland. I think my brother and I bought it jointly and read it one after the other – starting me on a lifelong trail. What a lovely story, Moira! I have books like this: a copy of My Family and Other Animals bought in Derby market with my best friend Pauline, when we were 16. It’s terribly tattered but I could never throw it out. I also like to abandon books in foreign places as well as discovering them. Some years ago, I was staying in a hotel in Halifax on business. In the lounge I found a shelf of books, including Ex LIbris by Anne Fadiman, donated, apparently, by The Globe and Mail. I was so charmed by the essays in this book, I decided first to steal it (go on, they’ll never miss it), but then chose to ask at the desk if I could have it. Ah, hotel books . . . What treasures can be found and Ex Libris is certainly one. In fact I think I have blogged about that book as I was charmed by it, too. My own feeling is that it is probably OK to take a book as long as you leave one in its place, but it’s a slightly grey area and you did the right thing!